A photo of twin brothers hugging has gone viral, but the story behind it has now turned heart-breaking. The two boys were born August 18 in Gainesville, Fla. 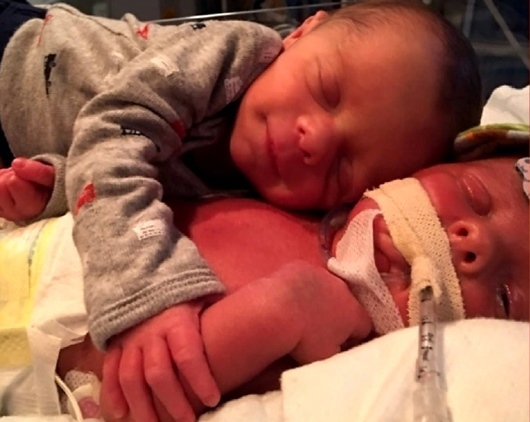 The boys’ parents chronicled Hawk’s journey on Facebook — and posted the sweet picture of both brothers meeting again outside of the womb with the caption. His mother, a nurse from Fort Pierce, says it was actually Mason who needed calming down that night. She took a picture and Mason and his brother Hawk, on a ventilator, went viral. “We didn’t expect it to take off the way it has. We have been contacted from Ireland, Scotland, Ukraine, United Kingdom, people from all over,” Guettler said. And except for the first few shares, most were just in love with the image, and had no idea the story behind the picture. Well, now you will. According to a report by CBS, as covered by Al Alam, that tiny twin, Hawk, who gave his brother comfort, he himself was fighting for his life. But a few weeks later Hawk succumbed to the condition.